Why doesn’t M&B look like a magazine? Many people are surprised the first time they see M&B because it doesn’t look like a typical magazine. Marathon & Beyond looks like a book but reads like a magazine and is a magazine. We wanted the magazine to be sturdy and have shelf presence, like a paperback book that you’ll want to add to your running library and refer to again and again. Time after time, our readers tell us that M&B is a “read and save” not a “read and throw away” magazine. 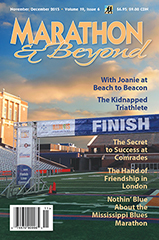 M&B will inspire you to run longer, better, smarter.